Alright everybody, get in the jeep! On your right is a Bull Elephant and a Silver Back gorilla. In front of us in the plain are the ostrich and antelope. That’s a lioness approaching now; please keep your hands inside the vehicle. 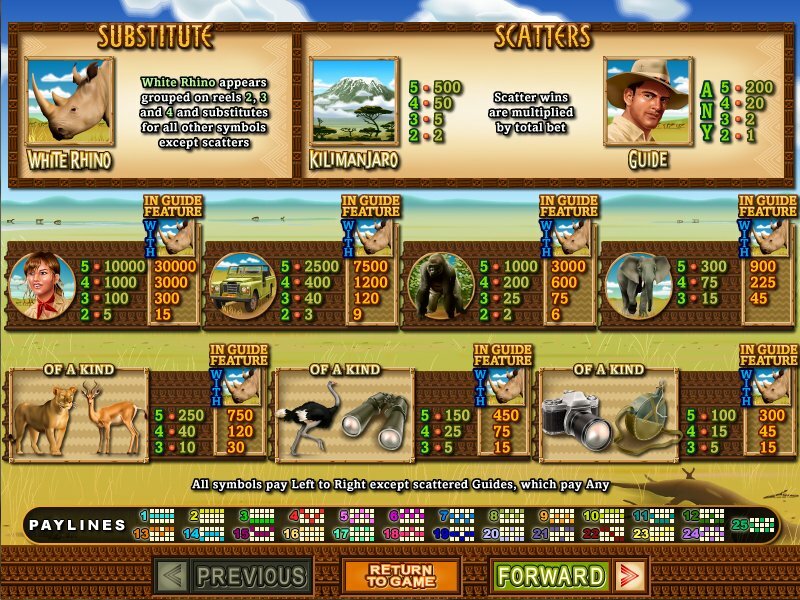 These are just a few of the sights you’ll find while on Safari at the 25 line White Safari slot machine. The elusive White Rhino itself is the wild symbol and getting three of them in your sights (on a payline) will trigger the White Rhino free spins feature in which each White Rhino on screen provides three free spins. A chance to get a photograph of the scenic Mt. Kilimanjaro scatter symbol awards you with re-spins while the reels showing Kilimanjaro stand in place and scatter symbols continue to pay out. The safari guide also acts as a scatter symbol and triggers the guide feature which awards you 10 free spins during which White Rhinos triple your prizes. A chance to get a photograph of the scenic Mt. Kilimanjaro scatter symbol awards you with re-spins while the reels showing Kilimanjaro stand in place and scatter symbols continue to pay out. 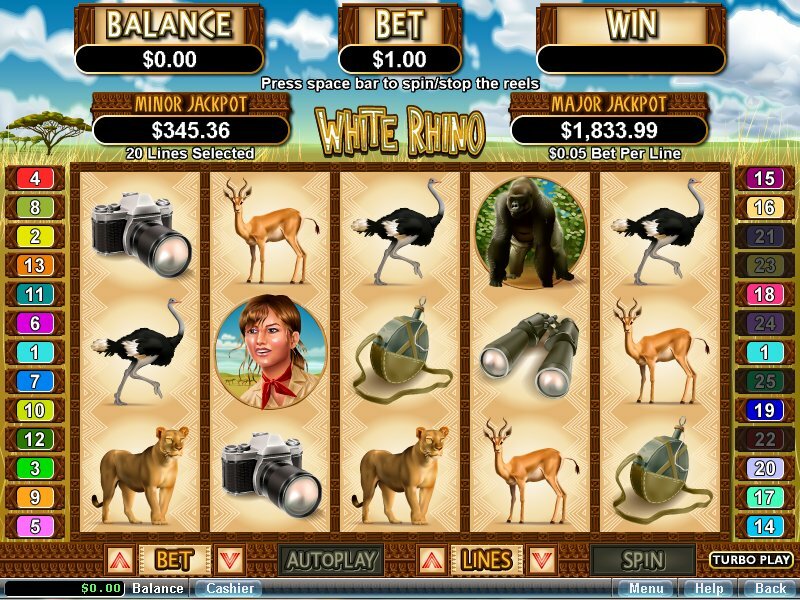 Technically, the White Rhino slot machine is a simple game like many other slot machines from Real Time Gaming. Symbols are simple and boxed in like old style slot machines and most symbols are static. Technology in most modern online casinos allows for much greater graphical possibility that entice players to keep betting. White Rhino slot machine is lacking this innovation, and could be greatly improved by it. Sound is also basic. Clicking spin reproduces the traditional clattering of spinning reels and music is only played during features. Though audio is of poor quality, the music is at least appropriate to the theme and adds a certain atmosphere to your special feature winnings.